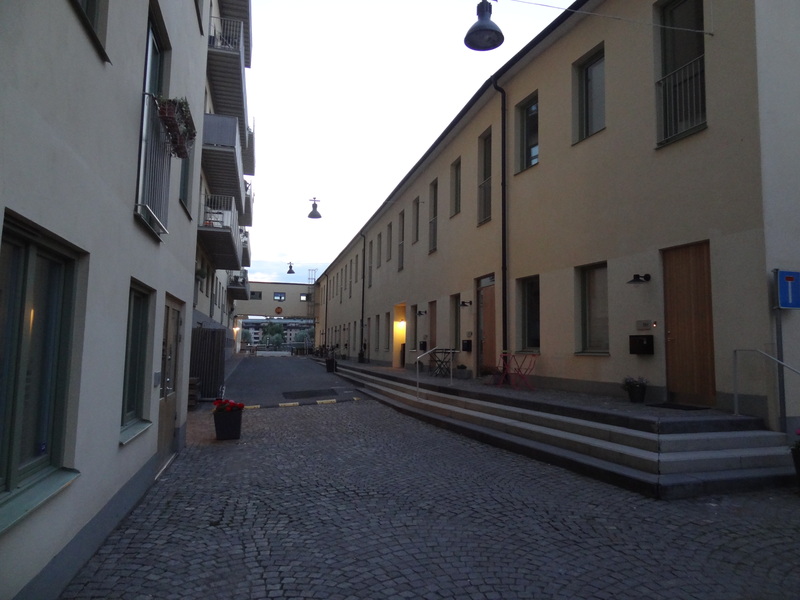 Back in the winter of 2012 I wrote about Helsinki’s interests towards introducing townhouses as a new housing concept. 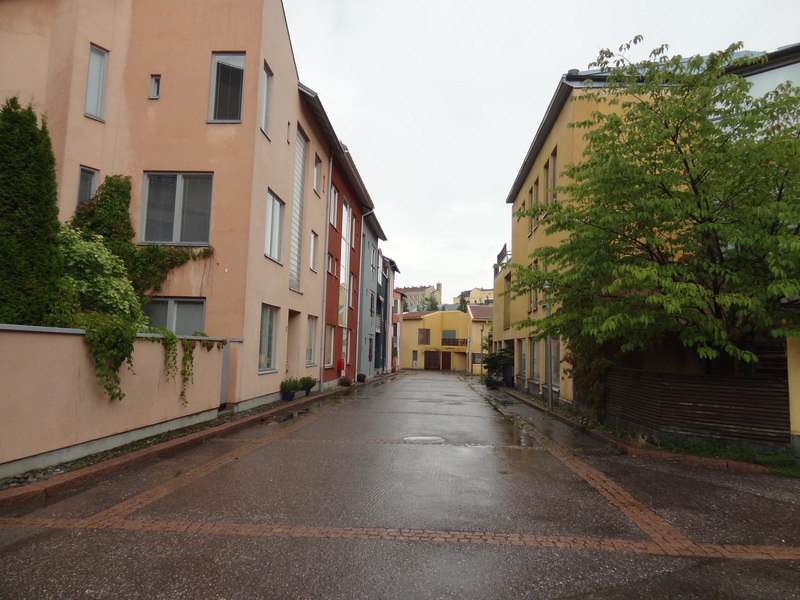 The topic is interesting, because the townhouse building type doesn’t have a history in Helsinki like it does in Central and Western Europe. Despite grand visions, only a few developments labeled as townhouses have been built so far. Later on at my previous employer, we organized a seminar to create discussion around the topic. To add some out-of-the-box flavored thinking on the issue, we invited a speaker from Stockholm to share insights from there as structures referred to as ”townhouses” had also gained more attention in the Swedish capital. What I learned from this experience was that although townhouses are non-traditional living concepts in both cities, little information has traveled across the Baltic Sea about this apparently similar trend. 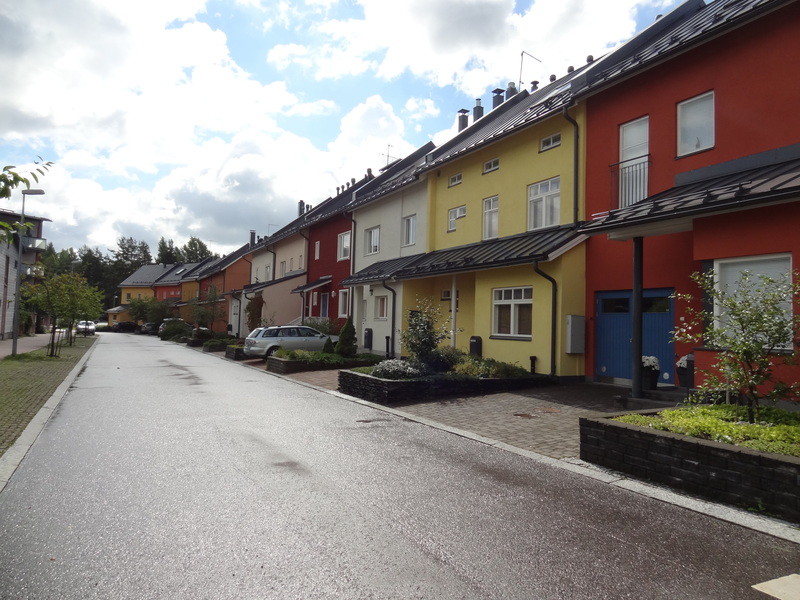 At the end of my recent European Urban Cultures studies, I decided to dig further into the topic to compare what the fuss about townhouses is all about. It became the topic of my master’s thesis. After an intense summer at the library instead of the beach, I’ve learned many new perspectives to evaluate townhouses in the two cities. And I thought I might as well share some these insights with you. You can find the full study here, under “Master’s Thesis” (links to my thePortfolium profile). In theory, 21st-century building concepts distance themselves from the 20th-century suburban living environments that revolve around the nuclear family and steady nine-to-five jobs and instead cater for changing demographic make-ups and socioeconomic conditions. One key reason is the environmental damage that lifestyle has caused, but Western societies are also increasingly composed of single-parents, childless couples, and singles – at the expense of the nuclear family. There are also more and more elderly citizens and cultural backgrounds to accommodate. At the same time work at the factory has been replaced my services and knowledge-based industries. For many of us this means that a detached single-family home segregated from the rest of the city just doesn’t provide a setting that would support our lifestyle. We are better off in urban environments which enable us to set up and sustain private and professional networks to our liking more adequately. Townhouses have many qualities that support the needs of the modern urban individual. The basic structure of the building can be used in many ways to create a variety of dwelling types within the same block or even the same building. Furthermore, the vertical circulation of a single housing unit can relatively easily be split into multiple units to accommodate expected or unexpected changes in life. Similarly, it allows multiple generations to live under the same roof which is common in many cultures. Townhouses also create urban milieus, because they are predominantly connected directly to the street and support high population densities. The ground floor may easily be transformed into a commercial space or work space. The latter suits the needs of the modern-day worker. So how does townhouse development in Helsinki and Stockholm compare against these assumptions for primary motives? Well, it’s fair to say that the picture is not as straightforward as this. The Stockholm townhouses – or “stadsradhus” as they often call them – fit more accurately to this picture than the Helsinki ones do. They are understood as more prestigious modes of apartment living, a way of offering attractive urban living. However, the Stockholm townhouses are not explicitly connected with ambitions of offering flexible housing types for a fragmented demographic make-up or a multicultural population. Even if Stockholm is a very cosmopolitan city with about 30% of the population having non-Swedish backgrounds and allegedly the highest share (60%) of one-person households in the world. The effects of adding attractiveness and livelihood to neighborhoods is in better currency. Not enough land? Build on rooftops as they do in Stockholm. In Helsinki the townhouse on the other hand is primarily assimilated with the suburban single-family home. They are claimed to be “urban” but at the same time close to nature, in a setting offering peace and quietness. At the core of their introduction is an idea to offer similar qualities on the housing market that families seek when they opt to move to the suburban communities beyond Helsinki’s jurisdiction. In this regional competition for tax payers the nuclear family is held as a driving force for urban development. Even if the statistics tell otherwise. 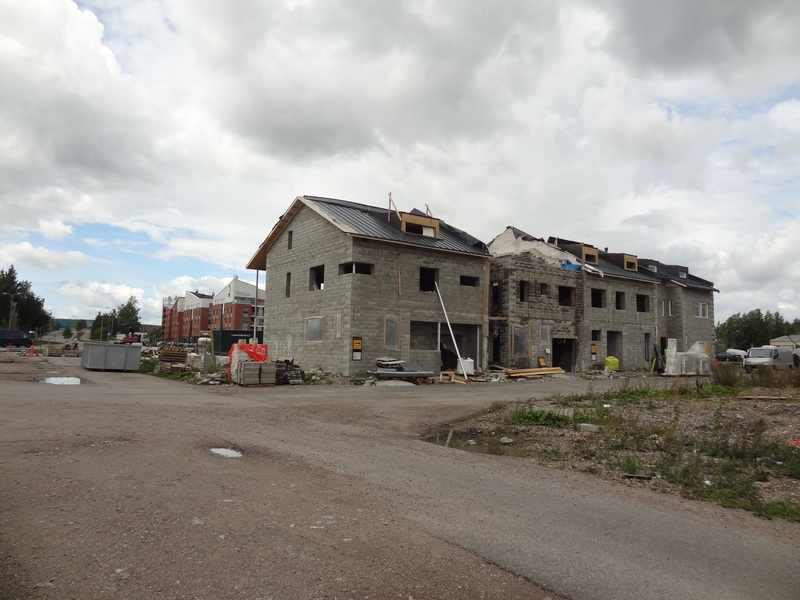 More Helsinki townhouses coming up! Hopefully the “town” aspect will follow suit. These ideas are also expressed in the materialization of townhouses. 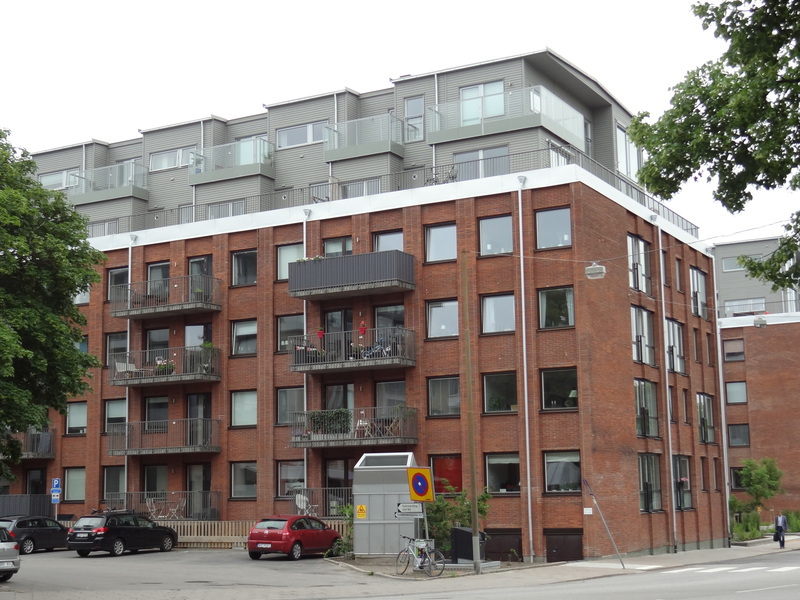 In Stockholm the building type takes more traditional forms in the suburbs where it is linked to ambitions for extending the inner city, but within the inner city townhouses are married to urban apartment-living even more clearly. The concept is built on rooftops, incorporated into the ground floors of apartment buildings, and introduced into refurbished old industrial buildings. 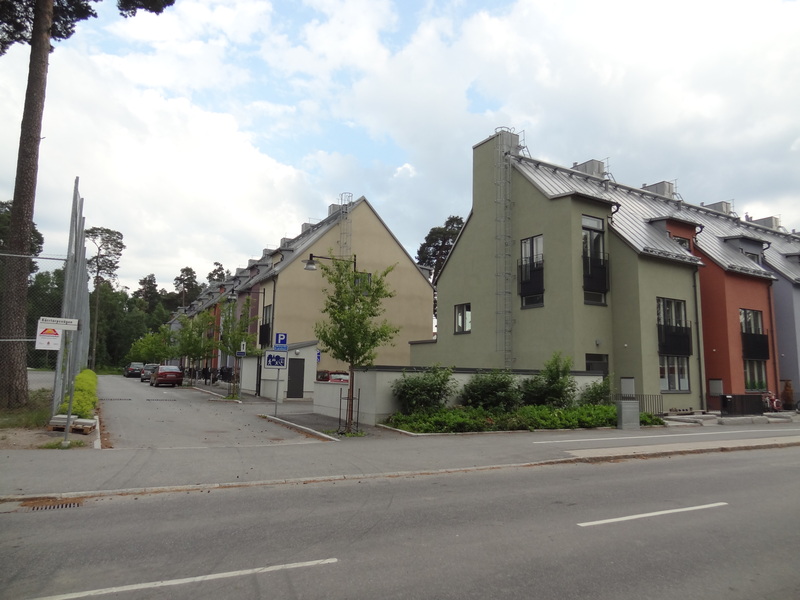 In Helsinki, existing and the majority of planned townhouses have a suburban configuration. They are built in areas where cars are a near necessity. Even the planned and hopefully in the future metro-connected area of Östersundom is almost 20km from the center of Helsinki. One key reason behind these very different conceptualizations of the townhouse is that in Helsinki they have emerged as public interventions whereas in Stockholm they are conversely built largely independent of public policy. Municipal competition for good taxpayers has guided urban development in the Helsinki region for decades. Stockholm on the other hand has focused on competing with other cities globally. This has been very successful and for example the Economist lists Stockholm among the top cities where to be in 2025 the way things are going. This also gets then reflected in what the building and construction industry produces: attractive homes for the creative industries worker. Previously lamps were produced around here in Stockholm. Now you can enjoy living in a townhouse instead. A discussion point I stumbled upon in my research process and find personally very interesting is the values that are embedded into housing production. Townhouse development in Helsinki is additionally strongly linked to a desire to protest against the building & construction industry that is argued to produce monotony. Homogenous buildings and one-size-fits-all apartments. Townhouses are coupled up with encouraging group building or even direct and independent owner-control of the building process of a single townhouse slice. In general, the building & construction industry is blamed to be too concentrated and only a few actors have an oligopoly in the market. Less competition means less innovation, they say. One of the more urban townhouse configurations in Helsinki. This is from Pikku-Huopalahti. Yet interestingly in Sweden the building and construction is even more clearly in the hands of a few actors. Local politicians are blamed to have too tight relations with the building & construction sector, which ultimately stifles any competition from the market. But arguably there are other forces at play here too. Despite similar accusations of an oligopolized construction industry in both cities, you can find many variations of the townhouse concept in Stockholm. The ideas are like from another planet when compared to what gets built in Helsinki – all building types considered. 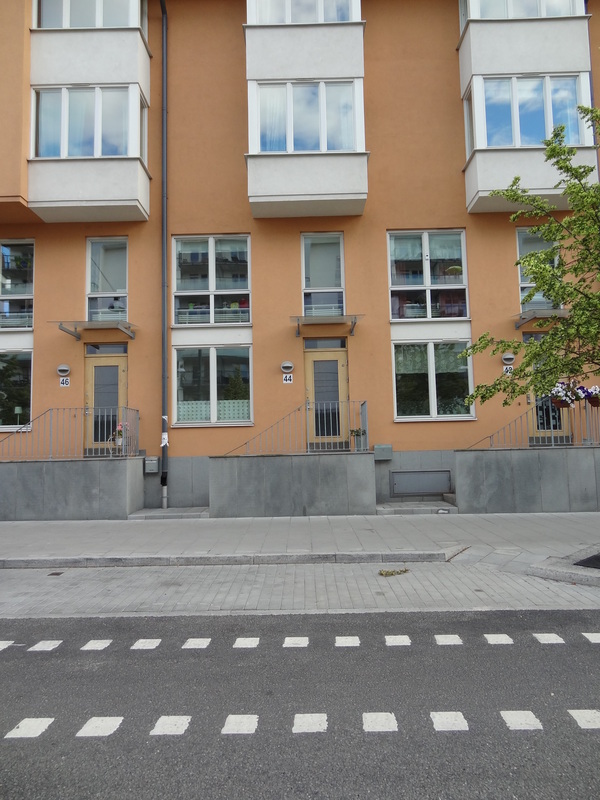 It’s not impossible to have your own door to the street and a back yard while living in an apartment building, Stockholm proves. So at the end of the day, to what extent can the reality of urban development in these two Nordic capitals be explained with differing nuances in official local urban policy, planning goals, and other bureaucratic and structural backgrounds? Or is it more relevant to talk about our attitudes towards the city and urbanity? Great post. I would be interested to learn more about the construction and financing of townhomes in Stockholm and Helsinki, and what lessons might be learned in the United States. Townhomes are undersupplied the the market I live in, and they can provide a good option for many who desire the privacy of a detached single family house, but also want the convenience of a walkable, urban place. The big impediment here is the finance and land use regulation system. I’m interested to hear more about how these projects get built in these two cities. Very interesting read, its also interesting to note where townhouses have become popular and successful, none more so than in my homeland and carbon munching land of Australia. Combination of esclating residential prices, desire to live in inner urban areas, yet not give up the ‘2-3 bedroom with large floorspace’ dream has resulted in townhouses being very much a saught after and sucessful concept. Obviously, I’d have to read the entire thesis, but I do question the “thesis” statement of the difference between Helsinki and Stockholm and this housing type being dependent on Stockholm being more of a world city. Demand for rowhouses has to do with the demand for land and the cost of land. In what we might call a middle situation, there is room for rowhouses in the market, while in stronger demand scenarios, only multiunit housing is built. It happens I am writing a piece on Helsinki for a project I am working on, and so I met with the embassy cultural attache just last week. Among other things we discussed was the relatively small size of Finland’s major cities, including Helsinki, so I have to believe that comparative lack of land demand there shapes housing type quite a bit. In the piece I just did about Vienna’s social housing program, I learned that there SFHs are hardly ever constructed, it’s all multiunit, because of the demand for housing and the resulting demand for land, vis a vis supply. There (and in a similar demonstration project in Hamburg’s Wilhelmsburg district) they also are doing some building height extensions not unlike one of the photos showing Stockholm from the cited blog entry.